Last month, I was all excited because both Google and Opera had announced to work together on a new fork of the Webkit engine called Blink and I assumed that a new version of the Opera browser would be just like the old ones with the rendering engines switched out. Now Opera has released Opera Next 15, which is not exactly billed as a beta nor a preview, but as a kind of development version. It is the much anticipated first version of the desktop browser with the Blink engine, but unfortunately it turns out I was wrong with my assumptions because there isn’t much left from the previous versions. But first the very good news: the Blink and V8 rendering engines are fast as blazes even on my old work notebook. 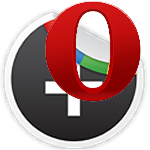 I had been using Google Chrome for Google+ and Facebook in the last months because Opera’s old Presto engine was simply slower than Webkit in these cases. Opera Next 15 is still faster and seems to consume much less memory, making it a more streamlined and not so bulky version of Chrome – working with it on Google+, Facebook, Twitter and even in WordPress is very smooth compared to Opera 12. This is the one most impressive feature of Opera’s new version and there’s absolutely nothing to complain about the speed of the browser. The bad news is that the user interface is actually just a clone of Chrome – there is absolutely nothing left from Opera 12. This has produced a huge backlash on the social media sites like the Google+ announcement and even on their own blog posting there is a lot of understandable anger. While this version is clearly labeled as a development build, removing everything that made Opera great before – the bookmark system, the sidebars, the high customizability, the download manager and many other things – is shocking to say the least. There isn’t even a proper bookmark system, the user interface is not customizable and the preferences are only a shadow of the previous version. I really hope that this release is really meant only as a demo for the new rendering engine, otherwise Opera will become totally redundant by just becoming Chrome with an Opera logo on it. The problem here is that Opera is not very communicative about the new version – if they would have said that it is just a test version to show the engine, it would have been okay. But this version, while impressively fast and really usable as a browser itself, completely lacks the individuality of an Opera browser. I can see the need to build up a new user interface after all that time and the first steps are okay, but if this is an indicator of a finished product, Opera has got a huge problem. I hope that the developers will come to their senses and put all the great features of the previous versions back into Opera 15 – otherwise many people will have to stay with version 12 and just use 15 or even Chrome as a secondary browser. I have actually switched from Google Chrome to Opera Next for some resource-intensive sites, but Opera 12 stays as my main browser until I can import my bookmarks into 15 and at least the most important features of the older versions are implemented again. I’m not giving up on Opera, but I’m a bit worried about the direction this could be heading. 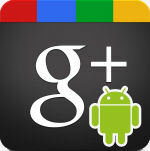 So on Wednesday, Google made some changes on Google+. Okay, make that a LOT of changes… during the IO Conference a whole lot of updates were announced and to the amazement of many users, were rolled out almost immediately. But while the changes of the user interface of Google+ are drastic to say the least, the new layout is not altogether new – it’s basically the look of the mobile app adapted to the desktop. The multi-column layout is taking a little getting used to, but it actually works quite well. The reactions from the users range from excited to horrified, but the majority seems to like it – and I have to say, that apart from some small issues, I’m also in favour of the new design. I loved the old user interface of Google+, but after using the Android app about half the time I was wondering how long the actually rather old-fashioned UI would last. A redesign was inevitable, and I think Google was quite successful with it – for a start, it does look like a completely original creation and now has left Facebook firmly behind. I was a bit concerned regarding the rendering speed since we don’t have very fast computers around here, but apart from the expected slight slowdown in Opera, Google+ now even works faster especially in Google Chrome. The user interface now doesn’t feel like a website anymore, but like a real program, especially when you run it in fullscreen. The new layout wastes a bit more screen real estate, but even on my small 1024×768 notebook screen it’s more than acceptable. Apart from the layout changes, Google has also changed the default font to Roboto, which is really easy on the eyes and now consistent with the Android system. But there are still some problems to be ironed out. Some photographers have complained about the new photo album system and there have been reports that the photo upload is sometimes extremely slow. I’m not a heavy user of the photo albums since I only throw my images in the photos from posts bucket and use the gallery software on my own website, but some users have real issues with the new system, which disrupted their workflow so heavily that they refuse to post any more photos. There is also one grievance that has hit me: when I want to upload a photo – which works now with drag and drop – the posting box becomes so big that I have to scroll down to use the post-button. This only happens on my 1024×768 notebook screen, but it’s still a little bit of nuisance which could be easily fixed with some smaller margins in the post box. It may be possible to fix this with a modified CSS code, but I have not yet looked into a solution for this. Overall, the new layout is an amazing evolution of Google+ and while the surprisingly fast changeover could have gone better and there are still some teething problems, there is no reason to believe that Google is going to ignore the users. More control over the look of the user interface would be good and there have been some rumours that this is exactly what Google is working on at the moment. 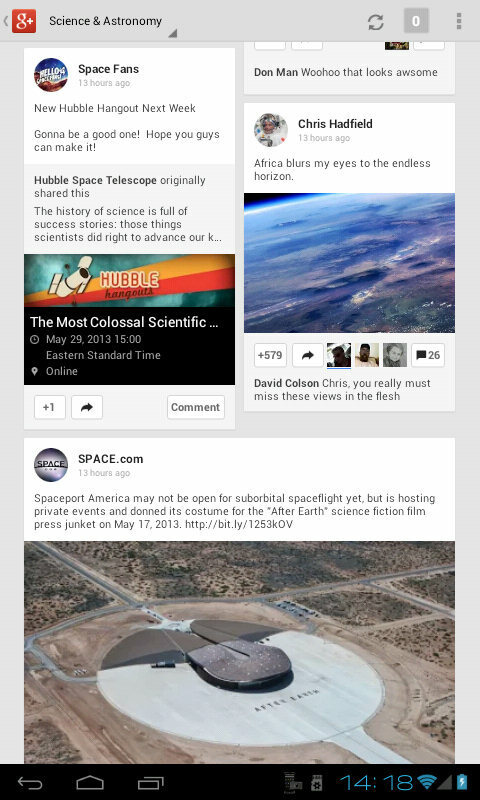 The new incarnation of Google+ will surely be even more improved and there is no need to panic or to do a rage quit. After all, Google is offering us a completely free service and while this does not mean that the users are not allowed to complain, there have been a few (understandable) overreactions in the last few days. 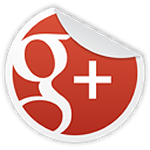 Google+ Icon comes from Dryicons.com – much better than the official ones :-). 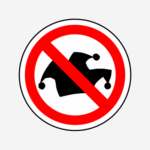 Back in March, the announcement from Google that their RSS reader will be closed down on July 1st came as a big shock and the scramble for alternatives immediately started. I must admit that I’ve been lazy and just sat back for a few weeks to await further developments, but now I’ve found an at least temoprary solution – it’s called Tiny Tiny RSS and is basically an online RSS reader which can be installed on your own webserver. I got interested in it because the programmer of the Android app gReader, which I exclusively use for reading RSS feeds, has integrated support for Tiny Tiny RSS in a new beta version. Tt really works, but also has a few drawbacks. First, of course, you need your own webspace. The Tiny Tiny RSS website says that shared webspaces won’t work, but I’m on a virtual server and I’ve had no problem installing and running it. Maybe it has something to do with the server load – I hope I won’t get into hot water with my webspace provider, but I don’t think this will put too much strain on the server. Installation is easy – if you’ve ever installed WordPress or some other software package you won’t have any problems following the Install Notes and the automatic, web-based installation routine. The best way is to put Tiny Tiny RSS on its own subdomain and give it its own database, but it can also work in a database with other stuff in it. The system requirements are somewhat steep, especially the requirement of PHP 5.3, which not everbody has installed yet. My webspace provider All-Inkl.com provides access to PHP 5.3.1 via PHP-CGI – all you have to do is put an .htaccess file with the line AddHandler php53-cgi .php into the root directory of the installation to make it work perfectly. I was able to run Tiny Tiny RSS on the very first try out of the box and I even managed to import my OPML feed list from the Google Reader which I had saved with Google Takeout. The web interface of Tiny Tiny RSS is minimal, but it actually works quite well – and the connection with gReader under Android works perfectly, too. There is actually no difference in gReader between using Google Reader and Tiny Tiny RSS. There is only one potential drawback, which I have not yet fully explored – updating the feeds. There is no manual method in the web interface, instead the software relies on several different methods to update the feeds. I can’t use the recommended way, updating as a daemon, because I don’t have command line access on my virtual server. I also can’t make manual changes to crontab, but I am allowed to run http-calls as cronjobs – there’s an obsolete, but still working method to do just that. The URL to start the feed update can also be called manually from any sort of webbrowser, even from a tablet. This is not exactly ideal, but the best method I’ve found yet. The best thing would however be to let Tiny Tiny RSS update on an external API call, but that is not (yet?) supported yet. I have successfully tried out Tiny Tiny RSS with gReader, but because of the feed update issue, I’m still using Google Reader as a RSS source at the moment. If I can get Tiny Tiny RSS running properly on my own webspace, it would be great, but I also would have no problem using another service like Feedly if I can get it to work with gReader. But it’s good to have a fallback method with Tiny Tiny RSS if nothing else materializes when Google Reader goes down in about eight weeks. Aus der Sicht des Webdesigners bin ich sogar erleichtert, daß ich für Opera in Zukunft keine Extrawurst mehr braten muß. Ich teste meine Webseiten zwar immer zuerst unter Opera und oft treten bei der Darstellung zwischen den verschiedenen Browsern dann auch kaum Unterschiede auf – aber meistens ist es dann beim Feintuning von Abständen via CSS meistens Opera, bei dem gelegentlich seltsame kleinere Diskrepanzen auftreten. Auf der anderen Seite ist mir aber Webkit auch nicht so fremd, als daß ich damit ein größeres Problem hätte – ganz im Gegenteil funktioniert jede meiner eigenen Webseiten und externen Projekte ganz hervorragend mit der Webkit-Engine. Was ist aber mit der eigentlichen Geschwindigkeit von Webkit? Wie viele Leser wahrscheinlich wissen, arbeite ich ausschließlich auf sehr alten Computern – mein Arbeits-Notebook ist ein mittlerweile fast zehn Jahre alter Compaq N610c, der aber trotzdem für meine Zwecke völlig ausreicht. Opera hat sich gerade auch früher auf noch erheblich älteren Rechnern immer als der schnellste und ressourcenschonendere Browser von allen herausgestellt, aber ich muß zugeben, daß ich inzwischen für Google+ immer öfter auf Chrome ausgewichen bin, weil die Web-Oberfläche des sozialen Netzwerks damit einfach viel flüssiger läuft. Auch bei bei WordPress merkt man den Unterschied und gerade unter diesem Gesichtspunkt fände ich einen Opera mit Webkit-Engine keine schlechte Idee. Die erste Opera-Variante, die mit der Webkit-Engine ausgestattet werden soll, wird ersten Berichten zufolge die Mobile-Version sein. Ob ich das gut finde, weiß ich noch nicht, denn auf meinem kleinen Android-Tablet hat sich Opera mit der eigenen Engine als schnellster Browser erwiesen und die Webkit-Browser eher als schwerfälliger. Vielleicht gelingt es Opera aber, einen richtig schnellen Webkit-Browser unter Android zu ermöglichen. Aber genauso wie bei der Desktop-Version wird man ja nicht unbedingt zu einem Upgrade gezwungen, denn zumindest unter Windows sind ja auch parallele Installationen von verschiedenen Opera-Versionen möglich. Fazit: der Einsatz von Webkit wird bestimmt nicht das Ende von Opera bedeuten, ganz im Gegenteil – es ist eine große Chance für die Zukunft und deshalb werde ich dem Browser auch in Zukunft weiterhin treu bleiben. Im Oktober hatte ich einen langen Artikel über eine Sammlung von Google+ Hangouts zum Thema Astronomie und Wissenschaft geschrieben, der nach drei Monaten ein Auffrischung notwendig hat. Statt den vorherigen Artikel zu überarbeiten, poste ich heute eine neue Version und werde dies zu einer regelmäßigen Sache machen, wenn sich wieder etwas geändert hat – eventuell wird es demnächst auch eine englische Version geben. Seit Google die Hangouts im August auch in Deutschland freigeschaltet hat und wir endlich auch live zuschauen können, hat sich einiges getan und gerade in Sachen Wissenschaft und Astronomie gibt es einige sehr interessante Veranstaltungen, die dieser Artikel kurz vorstellen soll.